Every year in September, people will gather at Tsurugaoka hachiman shrine in Kamakura to attend to one of unique ritual of Japan, Yabusame or horseback archery. Yabusame is shinto ritual creates to please god and encouraging the blessing of the land. The result of ritual predicts the harvest of upcoming year. 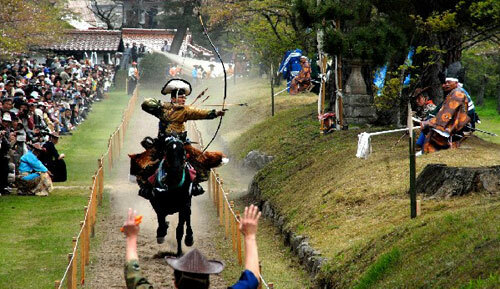 Japanese archers dress in traditional hunting outfit rides horse with high speed through 250 meters long track. Archer controls horse with his/her knee, bring up the yumi(bow) then use both hand to draw arrow and shoot at 3 separate targets fixed on bamboo rod along the track. All these process end in less than 20 seconds.